The recent deployment of HMS OCEAN to the Caribbean in the wake of Hurricanes Irma and Maria was a timely example of how UK Defence is able to respond quickly when civilian agencies have been overwhelmed. Her forthcoming decommissioning will expose a gap in UK capabilities. This is not going to be a rant about keeping her – she is being decommissioned for numerous valid reasons, not least the fact that as a result of the latest series of defence reviews the RN simply does not have the manpower or the budget to operate OCEAN as well as both Queen Elizabeth-class carriers (CVs). The gap she leaves will partly be filled by the second CV (initially PRINCE OF WALES from around 2022) and partly by the sole remaining RN (vice RFA) amphibious platform ALBION (if she survives), but neither is ideal. Instead I want to look at how we might regain the capability she represents in 15-20 years or so when ALBION and BULWARK are meant to decommission, arguably the first opportunity we will have to do so and for which studies are already well advanced. I am making the (dangerous) assumption that this capability will in fact be replaced, and that the budget will be slightly more than 50p. Others have explored at length the genesis of both OCEAN and the rest of the current amphibious fleet mix (thanks Sir Humphrey, Think Defence and this gem from Will Taylor), so I will refrain. Arguably circumstances are very different now, and this deserves a fresh look. Getting the most from your hulls is a central tenet of Royal Navy platform design and acquisition today, and likely to remain so. OCEAN is arguably the most capable ship in the RN today (noting that QNLZ is still under a blue ensign as of Oct 17, is years away from IOC, does not carry landing craft and lacks a ramp to embark vehicles or stores). That’s based on her spare capacity – she can carry up to 18 helicopters of varying types, around 35 vehicles on her vehicle deck, four landing craft and bunks for a maximum of around 1100 personnel (more in austere conditions). Crucially she is able to flex that capacity considerably, taking additional vehicles, stores or personnel whilst reducing the number of aircraft, but still able to shelter and maintain those aircraft below deck. The air wing can range from attack helicopters to heavy lift, maritime patrol and foreign types. She has two ramps that can reach to a jetty or floating pontoon to rapidly embark vehicles or stores. She has sensors and C2 facilities equal to any frigate, with the ability to embark up to a 2* battle staff (as demonstrated this year during JOINT VENTURE, although her facilities are not quite as polished as those on the LPDs). And she is small enough to berth easily in the majority of major ports without specialist support. No other ship in RN service has this range of capabilities, not even the LPDs (who are seriously short in aviation capacity). To demonstrate this capability, I want to explore her recent activity and use examples to show the versatility of her design. In particular, there are three activities she undertook in the last 2 years – Exercise DEEP BLUE, the deployment to the Gulf as Flagship for Task Force 50, and the hurricane relief effort Operation RUMAN. I will leave aside the fact that she executed numerous amphibious exercises on top of this, as that is her core role. Ex DEEP BLUE is the Royal Navy’s deep-water ASW training serial, though it regularly sees NATO allies participating fully. It provides a training and tactical development opportunity to practice counter-SSN warfare, exploiting the full range of capabilities available to the UK including submarines, Merlin HM1/HM2 helicopters, allied Maritime Patrol Aircraft and surface warships. In 2016 OCEAN was able to operate as an ASW platform by virtue of the Merlins from 814NAS being embarked, arguably the most effective ASW helicopter in service by virtue of its range and sensors. OCEAN lacks a sonar or anything beyond a deck, but the air wing changed her from a Cold War troop ferry into a front-line ASW platform – she is, after all, based on the INVINCIBLE CVS design. Operating away from the submarine’s location and in conjunction with friendly towed array frigates, her ability to launch aircraft from a far more stable deck means she can sustain multiple task lines of aircraft, whilst servicing and maintaining them effectively. The CVs will do this duty easily, but they are very large platforms and there will be many pulls on their time and availability. The LPD simply cannot do this without organic aircraft. When the UK took the opportunity to command a US task force for the first time in 2016, OCEAN was the flagship. This sort of duty is one that the UK expects to be able to conduct again when the larger CVs are in service, and the US is actively planning to incorporate the UK CV into their Gulf duty cycle. The duty is not about delivering strike aircraft, but is about command and control of widely dispersed naval forces in a high threat region, offering deterrence and reassurance whilst remaining poised to provide a contingent capability to any aggression. The effectiveness of any deterrence is difficult, if not impossible to measure using any realistic metric, but a Western naval presence in the Middle East, both inside and outside the Gulf, is recognised to be of strategic importance, and ceding it in any way will be taken badly by regional allies, as well as be exploited by potential adversaries. OCEAN delivered this capability faultlessly, requiring only the installation of a US IT system to allow seamless communication with other units. Adding such systems is a well-understood and regular occurrence, and is relatively simple to do requiring only a blown fibre network, desk space and appropriate IT hardware (which is usually tightly controlled by the US for systems such as SIPRNet). OCEAN commanded a variety of different warships, including Australian and French, executed numerous exercises including UNIFIED TRIDENT, embarked eight different types of foreign aircraft and conducted wide-ranging patrols across the TF50 area of operations. The CVs will do this by design, and the LPD could execute the C2 element. But without the air group, the LPD could not have such a significant effect across a broad area of operations, and the CVs cannot berth easily in most ports – it is likely that they will be limited to just one or two regional ports (Bahrain and Duqm). The ability to put a UK warship alongside, as OCEAN did in every GCC country in 2016/17, is a hugely important part of Defence Engagement and one that the CVs will be less able to do given their size. RUMAN was the UK’s response to Hurricane IRMA, and subsequently MARIA. Much noise and fuss was made in the media about the UK response, and it is particularly frustrating to see that RFA MOUNTS BAY, tasked to be on standby for hurricane relief duties, got little positive coverage. OCEAN was arguably a follow-up force to the initial response, and to achieve this she called into Gibraltar and embarked 240 pallets of HADR stores and 10 vehicles in less than 30 hours, a fantastic achievement. She arrived on task in the Caribbean just 11 days later and immediately began dispensing aid. The air group (including Chinook and Merlin HC3) rapidly transferred heavy stores inland, whilst the Wildcat BRH and Merlin HM2 conducted reconnaissance and stood ready for CASEVAC/MEDEVAC. The landing craft (9 Assault Squadron RM) ferried supplies and entered harbours damaged and blocked by the hurricane. This mixture of air and surface manoeuvre capability is unique in the RN, and will be lost once OCEAN decommissions in 2018. Although the LPDs and the LSD(A)s offer a similar capability, without dedicated aviation facilities they cannot sustain aircraft for any length of time and are constrained to primarily surface manoeuvre (although the LSD(A) can take on a temporary shelter for a single aircraft. The CVs can bring the aircraft, but not the surface manoeuvre, and as before will have significant demands and pulls on their availability. I’m not convinced (requiring further research) that they can berth in Gibraltar, and would have great difficulty in embarking such a quantity of stores and vehicles in the same timeframe (it would have to be ferried or flown out at greater cost). Comparison – OCEAN, CV and LPD. In summary then, OCEAN represents the loss of a large yet low-cost, flexible and highly adaptable platform, able to operate at tempo and deliver a superb range of capabilities at significantly lower cost than the CVs. She was acquired at low cost and uses largely COTS equipment. She is not without fault – she needs better engines (needing greater power for higher transit speeds – OCEAN is relatively slow), her auxiliary systems (such as chilled water and diesels) are complex, and she lacks top-line flag facilities (although she has nonetheless supported 1* and 2* staff embarkations). She really, really needs a bow thruster (berthing is challenging at the best of times when you are driving a large hollow box, especially into a less-developed port). But she is the most useful ship we have in service today and she is in far better material condition that some might claim. In our current/near-future force, with two CVs and two LPDs we can only really rely upon one of each to be available, with the CV configured for Carrier Strike. The other CV will nominally be roled for LPH duty, but it is a big, expensive asset, requiring significant resources and if operating is likely to be committed to major exercises and activity. If not, it will be in refit, training and workup which could easily exceed 2 years of non-availability. The second LPD (currently BULWARK) is basically mothballed. The only advantage that the LPD brings which OCEAN lacks is the heavy surface manoeuvre capability, the large dock capable of operating 4 Landing Craft Utility and the increased vehicle capacity. C2 facilities are better, but OCEAN could (and can) extemporise whilst a modification package could re-prioritise existing spaces to deliver the amphibious C2 element the LPD’s bring. Plus, PWLS will be fully fitted for landing force C2. But to my mind, OCEAN’s recent activities absolutely confirm for me that OCEAN is more useful in every scenario than an LPD with the single exception of a heavy over-the-beach assault, and does not carry the same issues regarding committing a large, costly and relatively less flexible CV to any small-medium scale operation. Replacement – Option 1 – Go big. The decision to replace the future amphibious fleet is estimated to be likely in the next few years, assuming the much-discussed mini-SDSR in 2017 does not delete the amphibious capability. One also hopes that the RN will resolve its acknowledged manpower challenges over the next decade or so. In the interim, PWLS is already being modified to bring the amphibious C2 fit, although she will doubtless stand off over the horizon and thus the key commanders, Commander Amphibious Task Force (CATF) and Commander Landing Force (CLF) may become detached. Modern C2 architectures based on satellite comms are great, but if satellites go down you are back to VHF/UHF line-of-sight radio, or HF which carries comms challenges of its own. A forward C2 node is still a critical part of any amphibious activity. If you take the C2 element away from the LPD, all you have left is basically a large troopship with a dock, so could you replace the LPD and the LSD(A) with the same platform? (note that the LSD(A) has over double the vehicle capacity of the LPD (1150 LIMS against 550 in the LPD). I still believe in the mantra that steel is cheap and air is free – size should not be a limiting factor, the predominant cost is in the design and the systems. Add this to the dock requirement for heavy surface manoeuvre, and the utility of an aviation-centred ship like OCEAN, and you see where the RN is going by examining options that include a 35k-ish tonne LHD – essentially OCEAN plus a dock, or ALBION plus a full-length flight-deck. An LHD guarantees the provision of aircraft shelter and maintenance facilities for a potentially large number of aircraft. OCEAN has shown the value of flexible onboard storage and the utility of a varied air group, so that you can balance extra aircraft against extra vehicles/LIMs depending on the mission. The dock gives you your heavy surface manoeuvre which, if we are serious about retaining an over-the-beach assault capability, is central to any scale of amphibious operation. The later US America-class hulls (LHA-8 onwards) are a good example of something in this class. Ships are still ships, and although the RN and RFA operate differently it should be perfectly possible to develop a design capable of being operated by both Services. The RN should be capable of operating a merchant-standard compliant design, and since we are not building a frigate or destroyer it should be cost-effective too. Some Danish inspiration may be taken as well. We still need to articulate our standards for watertight integrity and damage control, but these are not mutually exclusive (as OCEAN has shown) and are fundamental to the new National Shipbuilding Strategy. If done right, this offers commonality of parts and spares, something OCEAN (and to an extent the LPDs as well) always struggles with being unique in class. You get the surface lift capacity (at least 4 LCVP-sized craft and a variable number of LCU/LCAC-sized craft, depending on the design). You get the flight deck and hangar maintenance facilities – you don’t necessarily HAVE to crew up that capability if you just want the LIMs – use the flight deck and hangar partially or fully for storage. With the constraints affecting UK Defence aviation assets, the ability to deploy a relatively small air group onto a ship designed for this purpose is extremely useful. And you get a design that potentially could be operated by either RN or RFA personnel – this could be varied depending on manning limitations and/or budgets. Flexibility and adaptability is the key. On numbers we should realistically be looking for two of these at minimum to be crewed by the RN, and more if we are serious about extending the concept to the RFA. Timing the build and refit cycle carefully should guarantee the ability to have one CV and one RN-manned LHD available at any time, with either a second CV or a second LHD available as well. That guarantees three platforms at any one time. The LHD is effectively a Sea Control Ship, which can deploy at least a 1* staff, small TAG and embarked forces for anything from deep-water ASW to littoral manoeuvre and HADR/NEO. It becomes your go-to rapid-reaction platform for emergent tasking, leaving the carriers to focus on the carrier strike duty (which is predominantly going to be east of Suez) and picking up all the major exercises such as Joint Warrior. The LHDs are more flexible, as they should be able to quickly put in to any port to pick up new equipment or personnel. And if a major amphibious assault is required, the LHD acts as the forward C2 node commanding the force being deployed form the LSD(A) or replacement LHDs. Option 2 – Make do with what we have. A big amphib design will not be inexpensive. It may therefore be prudent to look at other ways we can use proven designs, at sizes we are used to operating. On that basis I can envision a future amphibious force centred on new-build OCEAN-class LPHs, and new-build Bay-class auxiliaries, the latter offering the dock capacity the LPH lacks. As I’ve made clear, I am of the view that the LPD is no longer the right platform – in most operational scenarios (away from pure beach assault) it is less useful than the LPH/LHD. The LPD does bring the heavy amphibious assault capability, four LCU-class vehicles and more LIMS than OCEAN. But the Bays have a dock and double the LIMS, they are well proven, hugely useful and capable, even if only capable of carrying one LCU and/or Mexefloats. So could we build more Bays to deliver greater over-the-beach effect, and build more LPH’s to deliver all the other elements I have outlined already? Consider a future amphibious force that has 2 LPH and six LSD(A) – that’s a lot of flexibility in platform employment, and a surface manoeuvre capability that is equal to a single LPD plus 2 Bays, which pretty much what we can muster today. More hulls, but affordable ones. Alternatives include a modified Bay with a larger well deck to bring more LCUs to the party, and the LPH ideally needs a steel beach, small dock or other design feature that enables vehicle offload whilst underway. But using proven designs, you can offset the LPD with existing hulls and still generate significant flexibility in your assets. Six LSD(A)’s is, however, a lot, and a better option would be to mirror the US Navy’s approach. 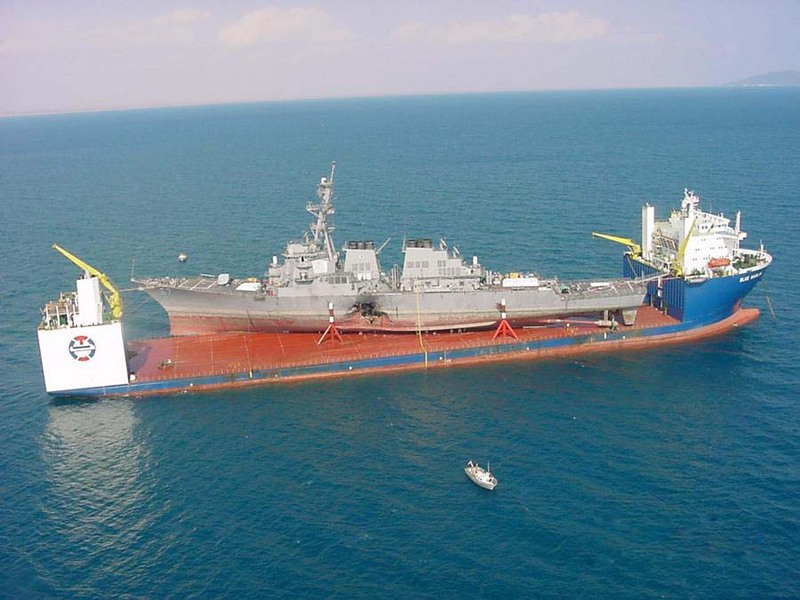 A single FLO-FLO vessel, such as the USNS Montford Point, obviates the sealift capacity limitation of the LSD(A)’s dock and would give you a capability to bring the LCU’s, Mexefloats and other vehicles to the assault zone without relying on multiple hulls to transport them. Having a grey FLO-FLO is also potentially handy for transporting small craft (up to MCM-size) to/from the Gulf, or recovering damaged vessels – consider merging with the capability DILIGENCE offers. Flexible and cost effective. The RN is tasked to provide a global capability to deter and defeat our enemies, and assist and reassure our dependants and allies. Until that major defence assumption changes, we should continue to examine our options and plan to replace our existing platforms with ones that provide the greatest flexibility and value for money, set against the future roles of two large aircraft carriers. This is one proposal – and a view that perhaps cancelling OCEAN was the wrong way to go. An excellent blog post and gd luck going fwd I look fwd to reading more. US marine Corp and new European ships of this configuration show just what the RN is missing. Ocean has been to every major op we’ve had since she was commissioned. Can’t help but think LHD is the ship type we should of built instead of cv. Thank you Mark, always nerve-wracking when sticking one’s head above the parapet like this! I can imagine, but more balanced contributions like this, benefits and educated everyone, and there is little of around. Good article. LHD seems the way to go. Good article. I agree that Albion is “no longer the right platform” but I’d suggest this is only due to a short-sighted design. Rotterdam or San Antonio would provide more utility. If we read between the lines at the moment the whole RN/RM amphibious capability is on the chopping block. Giving up the capability is rather foolish but we tend to elect bean-counting fools most of the time. I would therefore suggest that with Brexit and the need to forge new alliances we might be better off twisting the arm of the DFiD and suggesting they should fund six HADR/NEO ships and crew them with the RFA and UN peacekeepers. These would replace Albion, Bulwark, Ocean, Argus, and all three Bays and maintain a presence in two locations in the world and still possibly cover the Caribbean’s hurricane season. What these ships look like then matters in political circles. So Round Table class or Bay+/Rotterdam would probably be acceptable but San Antonio or Juan Carlos would not. The advantage of the LPD is that the flight deck is at the same level as the hangar which means no lifts. It also means operating, sheltering, and perhaps maintaining a Chinook is not quite as expensive as it would be on anything else. If these ships could also get two LCUs abreast in the well deck then all the better (sold as one plus one spare). This means the old LCU Mk9 design could return which provides more cabin space for embarked crew and a more useful loading area. They’d even be able to act as an ASW carrier with six Merlin and an escorting tailed frigate. The very fact that they’d fail to be able to operate F35B (unlike Juan Carlos, Wasp, etc) is a good thing when pitching them to the muppets that run this country. Thank you for the kind words! I see it a little differently – I think the LPD in UK employment had it’s day when we applied the ‘steel is cheap, air is free’ mantra to the LSD(A)’s, and built big – the Bays are essentially LPDs in their own right. In the LPD, the hangar is still separate from the vehicle deck, and so they lack that innate flexibility that I think the larger flat-tops have. Aircraft lifts are not such a weak point as we have considerable experience with them, so having your hangar and flight deck on the same level is, I think, more of a hindrance than a help. Chinooks are exposed no matter what you put them on, unless they go inside and they don’t have folding rotor heads. The other issue which I didn’t expand upon is that I also think that a dock compromises your innate seakeeping qualities – you need a wide, flat stern which makes motion in high sea states more unpredictable and wallowy. OCEAN retained the CVS-style deep cutaway aft and a V-hull all the way back, which I think makes her deck much more stable for blue-water operations. But I can’t be 100% certain of that; I’d need a real expert to weigh in. If you’re going for multi-role, you need to keep that true warship hull, making my option 2 (LPH plus LSD(A) plus FLOFLO) very much my preferred option. I must admit that stability is not something I’ve given much consideration to. I know that CVS has an active stability system that requires the ship to motor forwards. Not so sure about Ocean but you may well have a point about the V-type stern hull. It seems like you’ve just kicked the LHD out of touch. Does this mean the USMC and USN have it all wrong with 9 Wasp/America and 10 San Antonio or does it mean they never expect to operate copters in higher sea states? If you think about it, the big amphibs aren’t designed to operate in high sea states anyway as that puts boat ops out of limits (generally a sea state 3-4 and you’re out of limits both at the ship and probably the beach/surf zone too). The US doesn’t use their amphibs for ASW, so it’s a trick they miss out on. I guess these could realistically be STUFT because they’re generally used for the oil industry for positioning oil rigs? One of these full of LCUs nipping back-and-forth to Bay’s 1150 LIMs does indeed seem to be a good capability. I suppose then I can yield to your stable LPH and forward C2 node. The USNS MONTFORD POINT is exactly that! Great article, and agree that although funds are an issue in the RN, that doesn’t mean that LPD based amphibious capability is still the right approach. I agree with your option 2, but would still look to focus funds on additional escorts and SSNs above a large amphibious capability. Firstly, I would look at adding improved cranes on the current LSDs to carry LCMs on the deck to increase the Over The Horizon ship to shore connector capability. I’d also build a large auxiliary LPH to replace Ocean and Argus, primarily for helicopters with a couple of F35B landing spots. Any funds left over, I would look at building escorts that could act as hybrid forward troop carrying ships carrying @60 RMs each and ORCs/Rhibs/LCVPs – these would be able to deliver a first wave close to shore capable of securing landing spots for the helicopter lifted second wave and securing landing areas for the 3rd wave delivered from the LSDs. Another thing is that a chartered RFA is required in the Gulf to free up the Bay being used as the MCM mothership.